For the Australian anti-war group, see Stop the War Coalition (Australia). "Stop the War" redirects here. For the song, see Speak (artist). The Stop the War Coalition (StWC; informally Stop the War) is a British group established on 21 September 2001, shortly after the September 11 attacks, to campaign against what it believes are unjust wars. The Coalition has campaigned against the wars that are part of the "War on Terror" of the United States and its allies. It has campaigned against the war in Afghanistan and the Iraq War. It has been claimed that the demonstration against the latter on 15 February 2003, organised by the Coalition along with the Campaign for Nuclear Disarmament (CND) and the Muslim Association of Britain (MAB), was the largest public demonstration in British history. The impetus to form the Stop the War Coalition came following the 11 September 2001 attacks in the United States. The Coalition was launched at a public meeting of 2,000 people at Friends House on Euston Road in London, on 21 September which was chaired by Lindsey German, then active in the Socialist Workers Party. "The Stop the War Coalition has been formed to encourage and mobilise the largest possible movement against the war", said the founding statement. "Its aim is simple-to draw together everyone who wants to stop this madness, and to present the anti-war arguments which are squeezed out of the media." Among the sponsors of the Coalition were the former Labour MP Tony Benn, and the Labour MPs George Galloway, Tam Dalyell and Jeremy Corbyn, in addition to Tariq Ali, Harold Pinter, Suresh Grover and Andrew Murray. German became Convenor of the Coalition and a meeting on 28 October settled the Coalition's official aims. This meeting also elected a steering committee which consisted of representatives of Labour Left Briefing and the Communist Party of Britain. Representatives of the Communist Party of Great Britain (Provisional Central Committee) and the Alliance for Workers' Liberty failed to get elected, although both became members of the Coalition and participated in its activities. At this time, it was alleged that the SWP dominated the organisation, although German, Rees and Nineham left the SWP in 2009. The involvement of George Galloway among the leading figures was criticised by Nick Cohen in The Observer because of his alleged "support for every anti-American tyrant on the planet". The Conservative MP Julian Lewis, in a letter to The Daily Telegraph in 2003, referring to Andrew Murray's involvement in the Communist Party of Britain, wrote that he "had thought" his "days of unearthing totalitarians at the heart of 'peace movements'" had ended when the Soviet Union collapsed, but Murray was now in a "key position, being quoted by the anti-war media as if he were a representative of democratic politics". In this early period, Stop the War had a broad base. Ann Treneman wrote in The Times in January 2003 that the "two most obvious strands" of StWC support consisted of "the Establishment and the grassroots. This makes for some very strange bedfellows, who include retired generals, old peaceniks, former ambassadors, anti-globalisation protesters, Labour activists, trade unions, [and] the Muslim community". By the time of the February 2003 march in London, Greenpeace, the Liberal Democrats, Plaid Cymru and the Scottish National Party (SNP) were among the 450 organisations which had affiliated to the coalition, and the coalition's website listed 321 peace groups. At their initial meeting the Coalition also adopted the slogan "Against the racist backlash", asserting that a war against Afghanistan would be perceived as an attack on Islam and that Muslims, or those perceived as being Muslim, would apparently face racist attacks in the United Kingdom if the government joined the war. The Coalition worked closely with the Muslim Association of Britain in organising its demonstrations. Nick Cohen in 2003 criticised the relationship of the StWC with organisations he considers reactionary such as the Muslim Association of Britain. He accused the coalition of ignoring the requests of secular trade unions and Kurds in Iraq. However, Cohen himself was accused by Greg Muttitt of being extremely selective in his embrace of 'secular trade unions' in Iraq; in his newspaper columns, he never mentioned the most important trade union in the country, the oil workers' union, which called for the withdrawal of foreign troops. Cohen also asserted that there is a contradiction between the StWC's call for respect for human rights and its allegedly close links with organisations that openly call for the death penalty for homosexuality and apostasy. The largest demonstration organised by the Coalition was the mass protest on 15 February 2003 in London against the imminent invasion of Iraq. It is claimed to have been the largest ever such event in the UK with estimates of attendance ranging between 750,000 and 2,000,000 people. The march was begun by police earlier than planned because of the number of people who had arrived at the two starting points. Speakers at the rally in Hyde Park included Tony Benn, Jesse Jackson, Charles Kennedy, Ken Livingstone, Mo Mowlam and Harold Pinter. StWC had forecast at the end of January that about 500,000 protesters would be on the march. The Stop the War Coalition's 'Day X' demonstration as seen from the roof of the House of Commons. As the military build-up continued, StWC urged its local groups and supporters to organise actions on the day the invasion of Iraq began. As this date was then unknown, it was dubbed "Day X", which eventually fall on 20 March 2003. Despite having very little time to put plans into action, events took place up and down the country: in London there was a large protest in Parliament Square; in Nottingham traffic outside an army recruitment centre was blocked for a while; and large numbers of school students walked out of lessons. Following the beginning of the war and the events of Day X, the Coalition organised another national demonstration on the next Saturday, 22 March. While the turnout for this march did not match the demonstration of 15 February – Stop the War claimed up to 500,000, whilst fellow organisers CND claimed between 200,000–300,000 – it was noted that this was the largest anti-war demonstration held during wartime and had been organised with but a week's notice. The Coalition held a series of protests during November 2003 climaxing in a march on the 20th protesting against what it claimed is the aggressive foreign policy of U.S. President George W. Bush, and against the continued U.S. detention of prisoners in Guantanamo Bay, which protesters have claimed is an illegal infringement of human rights and the Geneva conventions. A march past parliament was organised climaxing in a rally in Trafalgar Square. A papier-mâché statue of Bush was toppled in an action reminiscent of the much televised pulling down of a statue of Saddam Hussein in Baghdad by American soldiers. Speakers included politician George Galloway, then SNP leader Alex Salmond and Vietnam War veteran Ron Kovic. The coalition estimated that 300,000 people were present at the demonstration, while the police put those attending at 100,000 people. On 19 March 2005, StWC organised a large demonstration in Westminster with supporters marching from Hyde Park to Parliament Square via the US embassy. The supporters were calling for the invading troops to move out of Iraq, for the US to not attack Iran and Syria, for the UK government to halt reductions in the civil liberties of UK citizens including the right to protest and a free trial (which they allege would result from the recent Prevention of Terrorism Act 2005 and Serious Organised Crime and Police Act 2005), and for a reduction in racism in the UK. The date was chosen as the it was the international day of anti-war demonstrations, as called by the Assembly of the Social Movements at the 2004 European Social Forum. Estimates of the number of marchers vary from 45,000 by the police to over 100,000 by StWC to 200,000 by some observers. The protest was the first occasion on which a march had passed the US embassy in London since the protests over the Vietnam War. Commentators such as Cohen and John Rentoul have accused Stop the War of being pro-Hussein. John Rees has written: "Socialists should unconditionally stand with the oppressed against the oppressor, even if the people who run the oppressed country are undemocratic and persecute minorities, like Saddam Hussein." StWC has been criticised by journalists such as Cohen for its refusal to condemn attacks on US and other foreign troops occupying Iraq, and refusal to condemn foreign insurgent fighters who have entered parts of the country. Following the 7 July 2005 London bombings, StWC in association with CND and the Muslim Association of Britain held a vigil for the victims at the Peace Garden in Euston, London on 9 July 2005 and a further solidarity gathering at Russell Square, close to one of the Underground stations targeted, on 17 July 2005. At the latter StWC national convener Lindsey German condemned the bombings but added that "The only way to end the bombings is to withdraw from Afghanistan, Iraq and Palestine. When we have justice around the world we will have peace as well". The StWC also supported vigils across the country. The StWC organised the British demonstration on 24 September 2005 using the slogans "Stop the Bombings", "Bring the Troops Home", "Defend Civil Liberties" and "Defend the Muslim Community". The protest coincided with protests in Washington, D.C. and occurred just before the Labour Party Conference began in Brighton. On 10 December 2005 the StWC held an International Peace Conference attended by around 1,500 people. Speakers from across the world included Cindy Sheehan, the American mother whose son died in Iraq; and Hassan Juma, president of the Iraqi Southern Oil Workers Union. At this conference a call was launched for an international demonstration on 18 March 2006. At the rally in London, Police estimating 15,000 marchers took part, but the groups organising the protest. which included CND and the Muslim Association of Britain as well as Stop the War, thought between 80,000 and 100,000 people had participated. According to Kate Hudson: "The government must listen to the voices of the people, which is calling on them to bring the troops home from Iraq". On 23 September 2006, a demonstration was held outside the venue for the Labour Party Conference in Manchester. Estimates of attendance varied from "around 20,000" by the police, "up to 50,000" from the Coalition, to "more than 50,000" by the Socialist Worker. The 2007 demo took place on 24 February 2007 in London, jointly organised with the CND. The themes of this march were No Trident and Troops Out of Iraq. On 15 March 2008 another international demonstration was held to mark the 5-year anniversary of the invasion of Iraq; although numbers did not match the original demonstrations, around 40,000 people were on the march in London. In Parliament Square, banners were placed in sight of the House of Commons. About the rally in Trafalgar Square, Tony Benn noted in his diary that he "spoke for four minutes and ten seconds. Two minutes was the limit, but I got away with it: they liked the phrase 'Parliament belongs to the past; the streets belong to the future'. They really liked that." A march from the American embassy in Grosvenor Square to Trafalgar Square on 1 April 2009 brought together protesters from the Stop the War Coalition, Palestine Solidarity Campaign, The British Muslim Initiative, and the Campaign for Nuclear Disarmament. On 2 April 2009, 200 people protested outside the ExCeL Centre where the G-20 Summit was being held. The Communist Party of Great Britain (Marxist-Leninist) was initially a member of the Stop the War Coalition. However, it and other individuals were expelled from the project on 23 September 2011 after it explicitly supported Muammar Gaddafi's Libyan Arab Jamahiriya in the Libyan Civil War against the NATO-backed rebels in Benghazi. The leadership of the Stop the War Coalition had claimed that the Benghazi rebellion, as part of the Arab Spring was a "popular rising" and Gaddafi the head of a "brutal dictatorship." The CPGB-ML claimed that the Stop the War Coalition was taking a pro-imperialist line, that the Benghazi rebels were CIA/MI6 backed and that this pro-imperialist line was influenced by the "various Trotskyite, revisionist and left-Labour luminaries in the leadership." John Rees stated on the overthrow of Gaddafi "nobody is going to shed a tear for the fall of this brutal dictator." Stop the War has also campaigned against British involvement in the Syrian Civil War, which began in March 2011, organising protests ahead of votes in the UK Parliament in August 2013 and December 2015. Samir Dathi wrote for the Stop the War website in June 2013: "Whilst many of us want nothing more than to see the ruthless dictator Assad go, we cannot support the further militarisation of the conflict, which will only perpetuate the horrific violence and refugee crisis in the region. If there is to be hope for the Syrian people, the first step is for all foreign interference to cease." On the morning of the House of Commons vote on 29 August 2013 against military intervention in Syria, the conservative commentator Peter Oborne wrote in an article for The Daily Telegraph newspaper that Stop the War "has consistently shown far more mature judgment on these great issues of war and peace than Downing Street, the White House or the CIA. More surprising still ... [it] has often proved better informed than these centres of Western power, coolly warning against the diet of propaganda masquerading as bona fide intelligence." The vote was "a vindication of the mass anti-war movement in this country over the last decade", wrote Andrew Murray in The Guardian. "The possibility is now open for Britain playing a different role in the world, breaking with the policies and preoccupations of imperialism", but "that change is nothing like secured yet." The then chair of Stop the War, Jeremy Corbyn, thanked supporters for lobbying their MPs. "There still exists the danger of renewed conflict as the interests of the military, arms dealers, and others remains ever present and very powerful", he wrote." Stop the War has been accused of having pro-Assad links. According to the journalist Andrew Gilligan in The Daily Telegraph, many individuals associated with Stop the War openly favour the Assad government. StWC vice-president Kamal Majid said in a speech at a conference organised by the New Communist Party in 2012 that the Assad family has "a long history of resisting imperialism", and should be supported "because their defeat will pave the way for a pro-Western and pro-US regime". In November 2013, it was announced that Mother Superior Agnes Mariam de la Croix had withdrawn from a forthcoming Anti-war conference organised by Stop the War for 30 November, after journalists Owen Jones and Jeremy Scahill had refused to share a platform with her because of accusations that she is a supporter of the Assad government. According to Amr Salahi, writing for the Left Foot Forward website, no Syrian was among the speakers at the event, but the former Guardian foreign correspondent Jonathan Steele said that he would have happily shared the platform with Mother Agnes. From 2011, Jeremy Corbyn was the chair of the Stop the War Coalition. When he stood as a candidate for the Labour Party leadership, the organisation's national convenor, Lindsey German, advocated that he should be supported. A week after his election as Labour leader in September 2015, it became known that he was stepping down as Chair of Stop the War, but would continue to support the group. Following the November 2015 Paris attacks, STWC published an article on their website titled "Paris reaps whirlwind of western support for extremist violence in Middle East". The piece was criticised by Labour MPs, including Hilary Benn, then shadow foreign secretary, who said it was "wholly wrong". He said that the attacks were not the fault of the French, rather it was the "fault of the attackers." By this time, the article had already been removed from the Stop the War website. StWC issued an apology. Murray told John Harris in an interview for The Guardian: "It didn't represent the organisation's views on Paris, and I think it was ... well, the best one could say is, extremely insensitive." Jon Lansman, of the Corbynite Momentum pressure group, commented later about the material concerning the Paris attacks: "I think even Stop the War themselves have accepted they were stupid for publishing those articles. There were some very silly things published, and wrong things." Caroline was specifically troubled by some Stop the War Coalition statements after the Paris atrocities. Though the pieces were subsequently taken down she felt unable to associate herself with them. She was also concerned that some Syrian voices were not given an opportunity to speak at a recent meeting organised by the StWC in Parliament. Following Hilary Benn's speech advocating air strikes in Syria in the House of Commons on 2 December, which drew on the history of anti-fascism, an article appeared on the StWC website. The article, soon taken down, read in part: "Benn does not even seem to realise that the jihadist movement that ultimately spawned Daesh [Isis] is far closer to the spirit of internationalism and solidarity that drove the International Brigades than Cameron's bombing campaign." A few days later, Andrew Murray commented that he thought the piece was "wholly absurd. It doesn't reflect Stop the War's view in the slightest. It was taken down as soon as I saw it was up there. I'd apologise to any Stop the War supporters who were upset by it." The editor of the website resigned. Stop the War lobbied MPs against supporting the proposal, along with members of Momentum. Both groups were accused of intimidation. Lindsey German wrote that she was "against bullying and intimidation. I condemn people who send abusive texts or messages" having received them herself. Following a demonstration in Walthamstow outside the constituency office of Labour MP Stella Creasy just before the December 2015 vote, which gained publicity at the time, German defended the rights of protesters. Nearly a week after the vote, on 8 December, it emerged that the Green MP Caroline Lucas had resigned from her Stop the War Coalition role because of the group's statements following the November 2015 Paris attacks and her concerns that Syrians attending the meeting had not been allowed to speak by the chair, Diane Abbott, at one of the group's parliamentary meetings. These concerns were shared by the human rights activist Peter Tatchell who told The Independent that Stop the War's "opposition to US imperialism ... sometimes mean[s] they will ignore the horrendous crimes of despotic anti-American regimes like Russia and Iran." In a letter to The Guardian, Tatchell and other "previous strong supporters" accused StWC of having "lost its moral compass and authority". John Rees wrote on 10 December 2015 that Stop the War does not support the Assad regime. It "does believe that it is the people of Syria who are the only ones who should decide the fate of their country free of all great power and regional power interference". Corbyn's continued involvement in the group became a source of friction with other leading members of the Labour Party. The former Labour shadow cabinet minister for Education, Tristram Hunt, described the group as a "really disreputable organisation" on 6 December when Corbyn's intention to attend the group's fundraising Christmas dinner on 11 December was becoming an issue. Former shadow ministers Emma Reynolds and Caroline Flint also urged him to distance himself from the group. Reynolds referred to the "abhorrent views" of Stop the War's leadership and described the group's positions as being "anti-West rather than anti-war", while Flint said they "are not Labour's friends". Corbyn attended the Stop the War event on 11 December in order to keep a promise to formally hand over his position as chair to Andrew Murray. In his speech at the event, at a Turkish restaurant in Southwark, south London, Corbyn said the "anti-war movement has been a vital force at the heart of our democracy" and "I think we've been right on what we've done". Tariq Ali, in an article for The Independent, thought the recent attacks on Stop the War were motivated by the "nasty and unpleasant war being waged in England, targeting Jeremy Corbyn" and wondered if the distancing of leading Green activists from Stop the War was because Corbyn "is attracting the electoral support of large numbers of hitherto Green supporters". The Stop the War Coalition (STWC) is in moral meltdown and in the throes of a rebellion by many of its longtime supporters – including me – over its one-sided Syria protests and its persistent failure to listen to appeals from democratic, anti-war and civil society activists inside Syria...The coalition won't even campaign for airdrops of food and medical supplies to besieged civilians... In a breathtaking display of double standards, they supported aid convoys to refugees in Calais but not to those in Aleppo. No wonder the movement is increasingly discredited. Symptomatic of the rot at the heart of Stop the War Coalition is former chair Andrew Murray's article published in the Morning Star in October. A leading official in the anti-war movement, Murray blasted the West but didn't even mention Russia's mass killing of women and children in Syria.. In October 2016, protesters heckled Corbyn, who was keynote speaker at event in London, because of his inaction on Syria. It's very difficult to justify how any Left Wing person can support StWC while it maintains its current double standards. I think he needs to recognise STW is a deeply flawed organisation with deeply flawed politics. StWC issue a statement after the chemical attack in Syria. There is no mention of Russia at all. Nor is there any direct criticism of Assad's regime. It says: "This attack must be condemned along with all the other atrocities of the war." All those who oppose the carnage in Syria and are concerned about the sharpening tensions around the world must raise their voices against more military intervention and demand an end to the fighting. In the StWC April 2017 conference resolutions neither Assad nor Russia are named. Concerning Syria, Motion 4 is the main motion, although it is primarily about Western military activity in Mosul, Iraq. The Resolution requests that the StWC leadership mount a major media campaign: to make the case that civilian fatalities in Mosul, Iraq due to western bombing "is now reportedly higher" than in the bombing of Aleppo by Assad. In the two years before May 2017, some contentious articles were removed from the StWC website. One such piece, by Alison Weir, concerned unsubstantiated allegations about the massacre of Israeli athletes at the 1972 Munich Olympics, while another by Richard Falk, was entitled "Time to go to war with Israel as the only path to peace in the Middle East". Kate Hudson, StWC officer, chair of the Campaign for Nuclear Disarmament (CND), former member of the Communist Party of Britain. Andrew Murray, StWC chair (2001–11, 2015–16), Chief of Staff of Unite the union, former member of the Communist Party of Britain. ^ "Nick Ferrari Vs Stop The War Over Russia's Syrian Bombs". LBC. 12 October 2016. Retrieved 2 June 2017. ^ a b "Building to stop the war". Socialist Worker (1769). 1 October 2001. Retrieved 14 December 2015. ^ Lewis, Julian (26 March 2003). "Anti-war protests led by Communist". The Daily Telegraph. Retrieved 14 December 2015. ^ Cohen, Nick (7 April 2003). "Strange bedfellows". New Statesman. Retrieved 14 December 2015. ^ a b Jeffery, Simon (15 February 2003). "UK's 'biggest peace rally'". The Guardian. Retrieved 13 December 2015. ^ "'Million' march against Iraq war". BBC News. 16 February 2003. Retrieved 13 December 2015. ^ Oliver, Mark (29 January 2003). "Galloway condemns government ban on park peace protest". The Guardian. Retrieved 13 December 2015. ^ Staff writer (20 March 2003). "School children march against war". BBC NEWS. London: BBC. Retrieved 29 April 2010. ^ "Thousands at anti-war rallies,BBC,23 March 2003". BBC News. London: BBC. 23 March 2003. Retrieved 9 August 2009. ^ "Protests at Bush's visit". BBC News. 18 November 2003. Retrieved 9 August 2009. ^ Staff writer (19 March 2005). "Anti-war protests target cities". BBC NEWS. London: BBC. Retrieved 29 April 2010. ^ Various contributors (20 March 2005). "Pictures from outside US Embassy – 19th March Troops Out Demo". UK Indymedia. Retrieved 29 April 2010. ^ "Thousands join anti-war protest". BBC News. London. 18 March 2006. Retrieved 16 February 2016. 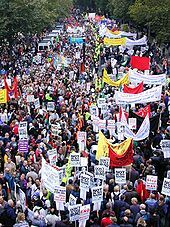 ^ "Reports and video of Manchester Time to Go demonstration, 23 September 2006|30Sep06|Socialist Worker". Socialist Worker. Retrieved 9 August 2009. ^ Benn, Tony (2013). Winstone, Ruth (ed.). A Blaze of Autumn Sunshine: The Last Diaries. London: Hutchinson. p. 109. ^ "London G20: Stop the War". politics.co.uk. Archived from the original on 12 July 2012. Retrieved 26 June 2009. ^ "Demonstrators at ExCeL centre for G20 summit". Stratford and Newham Express. Retrieved 26 June 2009. ^ "Stop the War leaders are trying to stifle debate by illegally expelling those who criticise them". CPGB-ML. 18 December 2016. ^ "Stopping the war machine: anti-war work in Britain". Lalkar. 18 December 2016. ^ "As the Libyan resistance fights on, 'Stop the War' misleaders are already dancing on Gaddafi's grave". CPGB-ML. 18 December 2016. ^ Sawer, Patrick (31 August 2013). "Syria crisis: Anti-war protesters claim public opinion victory". Daily Telegraph. Retrieved 17 February 2016. ^ Blundy, Rachel (1 December 2015). "Syria protest: Stop the War demonstrators descend on London in march ahead of MPs' air strike vote". Evening Standard. Retrieved 17 February 2016. ^ Dathi, Samir (17 June 2013). "Syria: the first step to ending the war is stopping western intervention". Stop the War. Retrieved 16 February 2016. ^ Oborne, Peter (29 August 2013). "The rush to judgment on Syria is a catastrophic and deadly error". The Daily Telegraph. Retrieved 16 February 2016. ^ Murray, Andrew (31 August 2013). "Syria vote: a corner has been turned on the road to peace". The Guardian. Retrieved 16 February 2016. ^ Rees, John (30 August 2013). "Message from Jeremy Corbyn MP, Chair of Stop the War". Stop the War. Retrieved 16 February 2016. ^ a b c d Gilligan, Andrew (8 September 2013). "Ed Miliband's friends of Assad". The Daily Telegraph. Retrieved 9 December 2015. ^ Koehler, Robert C. (5 September 2013). "Stopping a War Before it Starts". Stop the War. Common Dreams. Retrieved 16 February 2016. As always, the war's stated purpose — 'a punitive strike against the Syrian government' — is just a cover story. The U.S. and its possible allies, France and Great Britain, all have an interest in regaining influence in Syria, which requires Assad's collapse. ^ Jalabi, Raya (5 December 2013). "Critics question Catholic nun's 'alternative story' on Syria civil war". Retrieved 10 December 2015. ^ "Statement: Mother Agnes and the International Anti-war Conference on 30 November 2013". Stopthewar.org.uk. Retrieved 10 December 2015. ^ Barotchi, Noor (18 November 2013). "The British 'anti-war' movement's hypocrisy over Syria". Left Foot forward. Retrieved 10 February 2016. ^ Salahi, Amr (9 December 2013). "Stop the War conference: a one-eyed version of events in Syria". Left Foot Forward. Retrieved 10 February 2016. ^ German, Lindsey (16 June 2015). "Why Stop the War supports Jeremy Corbyn's campaign to be Labour Party leader". Stop the War. Retrieved 16 February 2016. ^ Nisbet, Robert (19 September 2015). "Corbyn Quits Anti-War Group After Queen Poem". Sky News. Retrieved 20 September 2015. ^ Stop the War Coalition. "Jeremy Corbyn: Why I'm standing down as Chair of Stop the War Coalition". ^ Dathan, Matt (17 November 2015). "Jeremy Corbyn faces prospect of resignations after Stop the War says Paris 'reaped whirlwind of Western extremism'". The Independent. Retrieved 10 February 2016. ^ a b Harris, John (11 December 2016). "Stop the War chair Andrew Murray: 'Everyone sees friends at Christmas. But Jeremy, apparently, has a problem'". The Guardian. ^ Doherty, Rosa (28 January 2016). "Ex-kibbutznik who is Corbyn's left-hand man". The Jewish Chronicle. Retrieved 16 February 2016. ^ Lucas, Caroline (8 December 2015). "Caroline and the Stop the War Coalition". ^ a b Perraudin, Frances (8 December 2015). "Green MP Caroline Lucas steps down from Stop the War Coalition role". The Guardian. London. ^ Philpot, Robert (21 December 2015). "In the shadows for 35 years, the activist now gaining momentum". The Jewish Chronicle. Retrieved 16 February 2016. ^ German, Lindsey (5 December 2016). "Were MPs bullied by anti-war protesters before they voted on bombing Syria?". Stop the War. Retrieved 16 February 2016. ^ Riddell, Mary (13 December 2015). "Caroline Lucas: I don't want to be a stick to beat Jeremy Corbyn with". The Daily Telegraph. Retrieved 2 September 2016. ^ a b Cooper, Charlie; Grice, Andrew (11 December 2015). "Jeremy Corbyn faces new pressure to disown Stop the War Coalition amid claims group has 'lost its moral compass'". The Independent. Retrieved 12 December 2015. ^ Mason, Rowena (10 December 2015). "Jeremy Corbyn determined to attend Stop the War event". The Guardian. Retrieved 12 December 2015. ^ -Rees, John (10 December 2015). ""For avoidance of doubt: the positions of Stop the War Coalition"". Stop the War Coalition. Retrieved 16 December 2016. ^ Watt, Nicholas (6 December 2015). "Jeremy Corbyn urged to pull out of Stop the War Christmas fundraiser". The Guardian. Retrieved 11 December 2015. ^ "Corbyn defies calls to shun Stop the War dinner". BBC News. 11 December 2015. Retrieved 12 December 2015. ^ Mason, Rowena; Rawlinson, Kevin; Harris, John (11 December 2015). "Jeremy Corbyn praises Stop the War coalition as vital democratic force". The Guardian. Retrieved 12 December 2015. ^ Ali, Tariq (11 December 2015). "The assault on Stop the War is really aimed at Jeremy Corbyn". The Independent. Retrieved 12 December 2015. ^ Tatchell, Peter (10 December 2016). "The Stop the War Coalition is more interested in fighting the West than fighting for Syrians". The Independent. ^ "Jeremy Corbyn heckled at Stop the War coalition event". The Telegraph. 8 October 2016. ^ Tatchell, Peter (31 January 2017). "Heres what Jeremy Corbyn could do, to win in 2020". Archived from the original on 28 June 2017. ^ "Peter Tatchell, Hero Of The Left, On What Jeremy Corbyn's Labour Is Doing Wrong". HuffPost UK. 29 January 2017. Retrieved 9 August 2017. ^ "Statement on the Situation in Syria". Stop the War Coalition. 6 April 2017. Retrieved 1 May 2017. ^ "Stop the War Coalition AGM 2017: Resolutions". 26 April 2017. ^ Sugarman, Daniel (15 May 2017). "Corbyn appoints anti-Israel activist as campaign chief". The Jewish Chronicle. Retrieved 18 December 2017. ^ Hughes, Laura (8 December 2015). "Caroline Lucas resigns from Stop the War, after finding herself unable to support group's 'recent positions'". The Daily Telegraph. Retrieved 8 December 2015. ^ Boffey, Daniel (10 December 2016). "Unite leader's aide leaves Communist party to join Labour". The Observer. Retrieved 10 December 2016.